Although nearly all the poems in Seoul’s subway are in Korean, a select few are offered in English, such as this classic William Blake poem in Gwanghwamun Station. Photo by Daniel Kriske. Seoul, South Korea is a city known for its K-pop songs that have become famous the world over, Samsung smartphones, food so spicy it will bring tears to your eyes, and the fastest internet on earth. The city emerged from colonialism and the wreckage of a brutal civil war, cast off the shackles of military dictatorship, and achieved staggering economic growth, earning the appropriate moniker “the Miracle on the Han River” in the process. However a further accomplishment of the city, one often not given more than a passing thought, can be found underground – the fabulous Seoul Metro. Referred to in full as the Seoul Metropolitan Subway, it boasts the longest passenger route length of any system in the world, in addition to the second highest number of stations and second highest daily ridership. Unquestionably huge and efficient, the system also has interactive digital maps on the platforms and uses an integrated fare system with the city’s buses. Yet there are also several basic aspects of the system that contribute to its success – these low-cost components can be easily replicated in the fledgling metro systems of the developing world to great effect. Small, quick, and easy to implement, these five user-friendly components of the Seoul Metro described below can help make metro transit the preferred mode of travel over the private automobile. First cup of coffee in the morning wasn’t enough? Need a small snack to eat during your morning break? Want to read up on the latest negotiations with North Korea? Thankfully, pocket-sized stores and vending machines are located directly on the platforms. Even if the next train is only two minutes away, you still have time to grab that drink, snack, or newspaper. 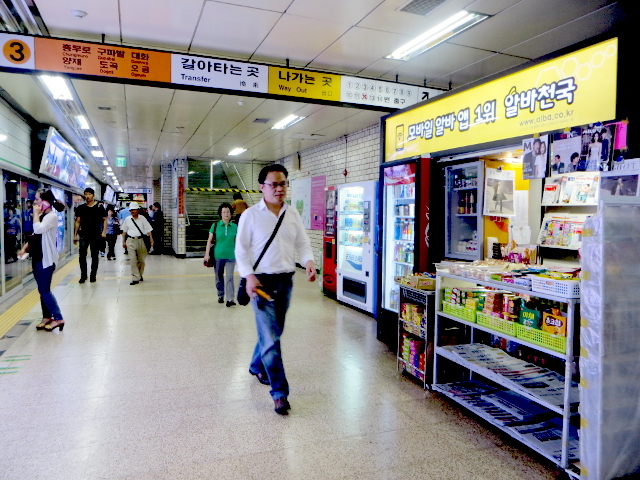 Platform vendor with a variety of goods at Seoul National University of Education Station. Photo by Daniel Kriske. It can be frustrating, particularly during the morning rush hour, to fight through crowds of people on the platform when transferring to other lines. Luckily, route maps posted on the glass safety doors can help riders to determine which specific car door will lead to the shortest transfer when they exit the train. 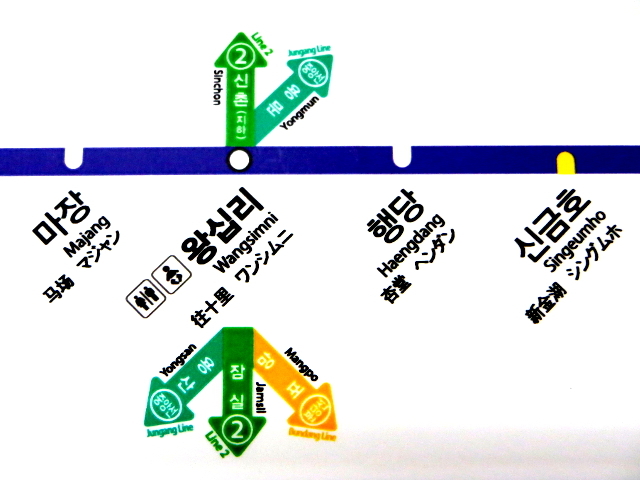 While most metro systems post route maps in the cars, the maps of the Seoul Metro include one additional helpful feature – next to certain stations a small restroom icon is placed, indicating that there is a restroom within the paid area. Drink too much coffee in the morning, or have food last night that was just too spicy for your stomach to handle? Simply get off at the marked station and use the restroom facilities without having to exit the ticket gates, saving both time and money. Shown here is a detail from an in-car route map. In addition to the restroom icon next to Wangsimni Station, the baby icon indicates a room for nursing mothers. Photo by Daniel Kriske. Located near the exits of every station are additional maps that show the layout of the surrounding neighborhood. Helpfully giving the location of major buildings, tourist sights, and streets relative to the station exits, you won’t even need to use your smartphone’s mapping feature to find your way. Always fiercely proud of their history and culture, Koreans make every effort to keep tradition alive and well. 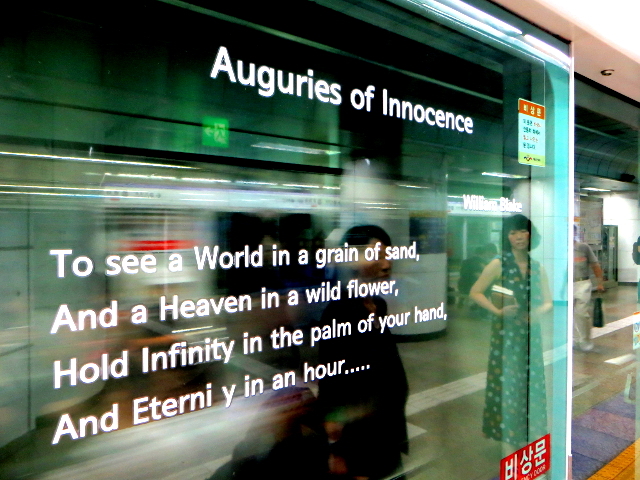 In the metro, stations feature Korean poems by native authors on the glass platform safety doors, a wonderful effort to preserve important literary heritage in such a seemingly modern utilitarian environment. A few stations also have poems in English by Western authors, accompanied by Korean translations. Inclusion of cultural artifacts such as poems is just one small way that systems in developing cities can retain their individuality, traditions, and character – even in the face of development and modernization. Of course, these five practices are second in importance to more vital aspects of a metro such as its size, speed, punctuality, safety, cost, and reliability. However once these preliminary requirements have been met, implementing these low-cost, simple, yet innovative ideas found in Seoul could improve the passengers’ travel experience in any city, and are surely an investment worth making.